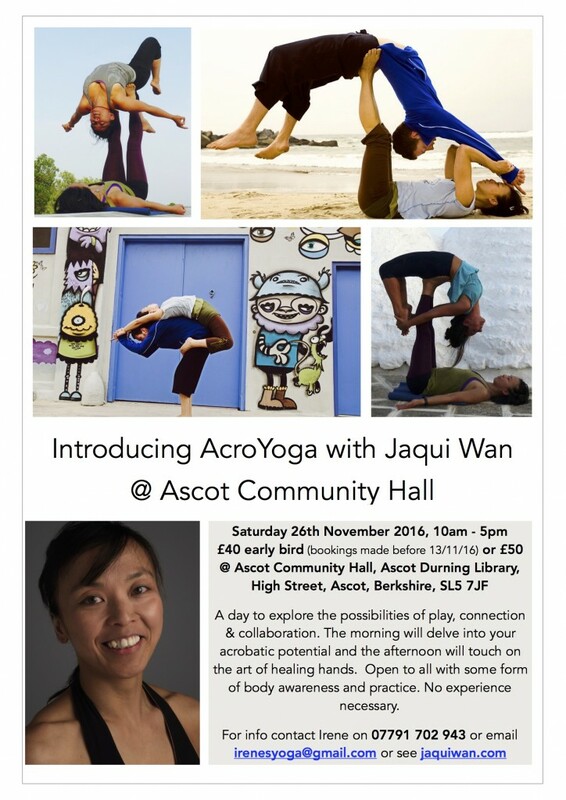 Our introduction to AcroYoga is a first for Ascot, thanks to Irene Clark, and should be marked as an all day play day. I will share with you the realms of this practice that brings about the collaboration of yoga, acrobatics and healing arts. The day will will act as an introduction to the limitless possibilities that is AcroYoga. In the morning from 10am – 1pm, we will explore the solar side to the practice. We will touch on the fire side to the practice with acrobatic conditioning to prepare you for inversions and partner balancing, with the potential to work on simple transitions, as well as playing with human pyramids. This is suitable for complete beginners, though body awareness is an advantage, it will be a great opportunity to delve into the world of being upside down and the art of communication and the human potential to do seemingly impossible things. There will be an hours lunch break from 1-2pm. In the afternoon from 2-5pm, we will delve into the lunar side of the practice beginning with partner yoga and assisted stretching and there after delve into world of Thai massage with leg love. We will introduce suspended flying therapeutics, involving a base and flyer. The base grounds and suspends the flyer with their hands and feet to create the potential to release tension and muscular holding patterns. The passive nature of the flyer enables the base to sculpt the flyer into a variety of shapes that stretches and opens the flyers upper body. This day is open to all but some body awareness or body work practice would be an advantage.